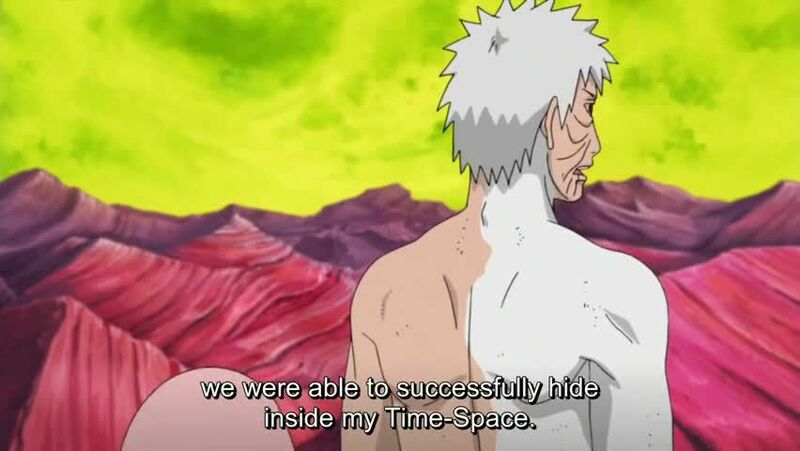 After Kaguya separates Naruto and Sasuke, Naruto’s clone, Obito, Sakura and Kakashi watches Naruto fight Kaguya alone. Obito is certain that he can synchronise his Kamui with Kaguya’s Space–Time Ninjutsu to retrieve Sasuke. Kaguya notices them, but keeps focused on the real Naruto and attacks him, who uses Kokuō’s chakra to enhance his taijutsu and the two clash. Kaguya is pressured by Naruto’s clones, and opens another rift allowing Obito to sync with it and Naruto follows Kaguya through it. Black Zetsu notices Naruto followed them to the main dimension and Kaguya her to kill Naruto, despite her wish to absorb his chakra. Kaguya strikes Naruto with her bones and returns to her ice dimension, believing to have killed the original. Obito and Sakura appear from Kamui’s dimension, intent on finding Sasuke. Kaguya and Black Zetsu are surprised that Naruto’s clones are still in the ice dimension. Sakura channels her stored chakra into Obito, who begins looking for Sasuke through Kaguya’s dimensions. Black Zetsu determines the original Naruto has Truth-Seeking Balls. Obito and Sakura find Sasuke, who manages to cross the opening created by Obito’s Kamui by switching places with Sakura’s jacket.